What you need to know about choosing the right CRM to help your small business grow. You’re a small business with a great product. Your initial customers love you. Your investors love you too, and they want to see you grow. So, it seems like you need a CRM that’s smart enough, and powerful enough to handle that growth. But, which one do you choose? First, what is CRM? CRM stands for customer relationship management and is a type of software tool for sales professionals. CRMs help small businesses maintain, manage, and nurture their customer relationships from first contact to prospect to customer, build strong relationships. Let’s explore some of the top factors a small business may consider when choosing a sales CRM. We’ll look at how a CRM needs to grow as your business grows; pricing issues; and staff adoption of a new CRM. Many small businesses don’t have the full set of resources needed to compete in the modern market. Underfinanced, understaffed, unable to hire the experts needed, they see sales CRM software for small business as being expensive, and too much of a technical challenge. But that’s where they’re wrong. No two businesses face the same challenges, and present the same issues to be resolved. That’s why finding the sales CRM that’s a perfect match for your business process is essential. Pick a CRM that will grow with your business – Scalability is a major concern when investing in a CRM. A small business needs to choose a CRM which is fully scalable and is designed to grow with their business, capable of answering all their needs now, and in five years time. Cheap doesn’t always mean value – Pricing can be a major concern for the small business. But, a small business should try to choose a CRM with scalable features – such as add-ons and integrations – and a price which matches this scalability. Onboard your staff as well as your new CRM – Staff willingness to onboard is completely necessary for the success of your new CRM. In order for your staff to adopt the new CRM, their advice and involvement is vital. The CRM needs to solve all of their problems, face all their concerns, save them valuable time, and be simple to learn and use. What do small businesses expect from a CRM? What expectations should you have from a CRM software for small business? 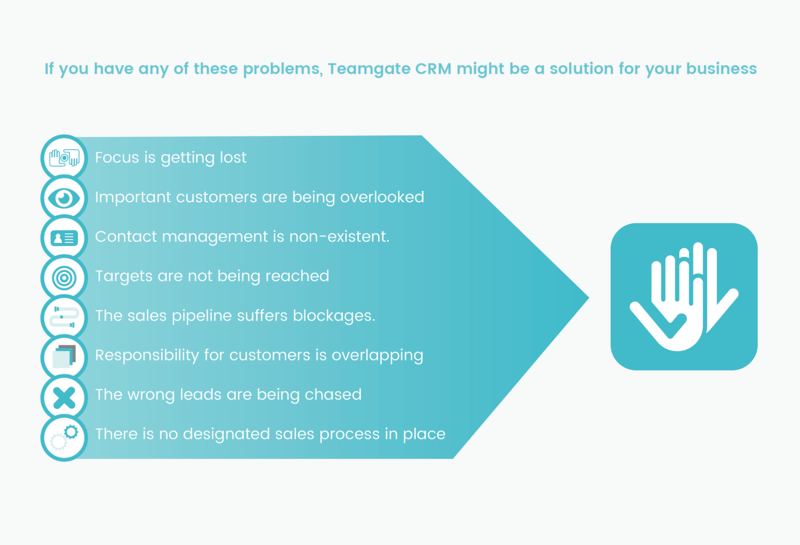 Easy to get started – Thanks to the Teamgate customer experience team, you can remove the fear of sales CRM onboarding. From installation, personalised online tutorials, access to one-on-one customer care, and a super easy interface, Teamgate CRM sales software is the simplest, and strongest full sales solution for small business. It’s no wonder that Teamgate was awarded the number 1 slot in the Capterra Most User-Friendly CRM Software List. Affordability – Small businesses can rarely afford expensive solutions. Teamgate is the easily affordable sales CRM, which actually saves you money in the long run. Due to its scalable functionality, you decide how much you want to invest. 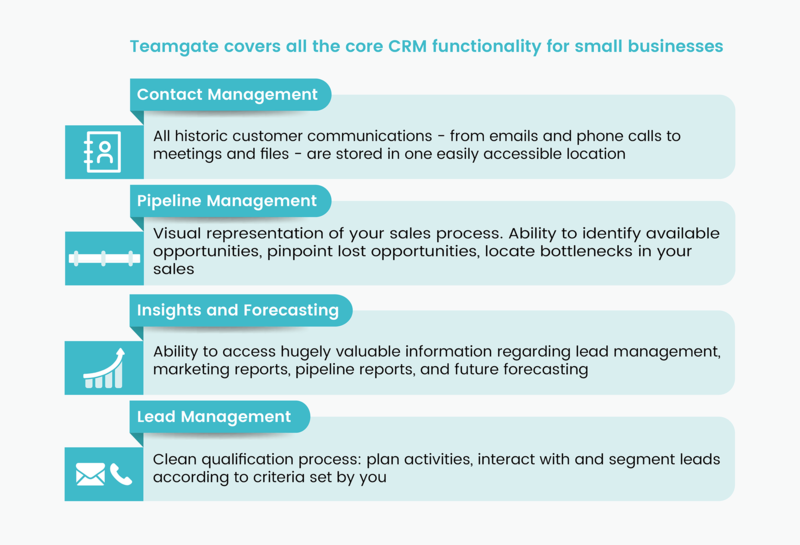 Small but powerful – Teamgate CRM solutions for small business cover every aspect of your sales process. Through an easy set-up, and simply designed interface, Teamgate offers a simplistic and understandable user-experience. The scalability of Teamgate is one of the features which makes it one of the best online CRM programmes, ideal for small business. Its functionality is as complex, or as simple as you need it to be. It expertly manages your whole sales process from lead management, contact management, and sales management, to closed deals and customer service, in clear, and easily managed steps. Fully customisable – Every business has different needs to be resolved. Each stage of the Teamgate sales process is fully customisable, ready to match those needs. With customised fields, each of your contacts can be uniquely labeled, identified and tracked. Along with pre-set fields and tags, it’s also possible to customise all of your contacts with your own fields and tags – making it fully flexible. Smart integrations – In order to further enhance the functionality of CRM systems for small business, many CRM solutions allow smart integration with the company’s website. Teamgate is no exception, with a huge range of integrations which add automated functionality to your sales process. Collaborate easier between sales and sales support with integrations like Zendesk and Freshdesk. Improve inter-team communication with Slack. The intuitive integration between Teamgate CRM and MailChimp allows you to target specific leads and contacts with email marketing campaigns. Teamgate Forms for WordPress gives you the power to connect your website directly with Teamgate. Plus, a clever integration between Teamgate and LinkedIn lets you import targeted contacts directly from the LinkedIn network. Scalability – Successful company’s grow, but they need to know how to grow, and how to perform adequately under ever-expanding commercial and physical demands. They need to be scalable. That’s why small businesses need to have measures in place which allow for established processes to grow seamlessly. Teamgate sales CRM is designed to scale as you grow, permitting its users to upgrade accordingly to their needs, from basic entry level all the way up to the CRMs enterprise plan. With an ever-expanding range of integrations, Teamgate ensures that regardless of the size of your business, your CRM is always equipped to compete at each new level. There is a wide range of specifically designed CRM tools for small business, and should be carefully considered. Below are some of the key functions of the combination of these tools. #1 – Contact management – Teamgate contact management abilities are designed to take your customer interactions to the next level. All historic customer communications (both people and companies) – emails, phone calls, meetings, file transfers, and account ownership – are stored in one easily accessible location. Detailed, and highly organised contact management give you a clearer overall picture of your customers and the health of your relationship. It’s also imperative to have access to all that information no matter where you go; giving you that complete picture of every customer. Teamgate contact management also allows colleagues – with permission – to seamlessly take over customer handling with full access to all historic communication history. #2 – Sales pipeline management – CRM systems for small business should be capable of managing every stage of the sales pipeline to suit your sales process. From lead management to sales management Teamgate allows you to identify available opportunities, pinpoint lost opportunities, locate bottlenecks in your sales process, and forecast for the future. With easily interpreted insights, Teamgate pipeline management offers you the ability to access hugely valuable information regarding lead management, marketing reports, pipeline reports, and future forecasting; all vital for the growth of any small business. #3 – Lead management – Teamgate superior sales CRM is perfect lead management partner for small business. Manage all of your leads from one convenient place, aiding a clean qualification process. Plan activities, interact with and segment leads according to criteria set by you, and simply convert qualified leads to deals. Teamgate CRM tools for small business gives you a wide range of easy and intuitive lead import tools to use across multiple sources. You’ll never again have to worry about duplicating contact details when imported data. Contacts can be segmented according to the categories. Additional filters may then be applied to the contacts – creating a well-organised and easily searchable database. As your business grows, choosing the right sales CRM, to suit your needs, is essential. Recognising your needs, and the correct CRM which can resolve those needs, and grow along with your business is a great start. Teamgate CRM can offer you all of the above, plus the software is constantly being upgraded seamlessly to match any future needs. It is scalable, affordable, easy to use, and chock full of features designed to handle, and simplify every stage of your small business sales process. Don’t let the tasks you once found easy become the obstacles which stunt your growth. Do you have a CRM that keeps you organised? The most user-friendly CRM on the market. 14-day free trial. 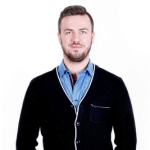 Chris is a marketer and a growth hacker here at Teamgate. He writes everything about sales management, online marketing, awards and the best new features coming out.